Jeffrey Chappell is the pianist in the contemporary jazz quartet, Otherworld, which won a Global Music Award for their debut album. He has performed at the Stanford Jazz Festival and the Key West International Jazz Festival as a pianist. He appeared at the East Coast Jazz Festival as a conductor of the Goucher College Jazz Ensemble and the Levine School of Music Jazz Ensemble. He has also led the Levine School of Music Jazz Ensemble in performance at Washington, D.C. venues including Carter Barron Amphitheater, the Folger Library, the National Building Museum, the Ronald Reagan Building, and Union Station. As Director of the Goucher Summer Arts Institute Jazz Camp from 1999 to 2013, he appeared in annual concerts at Goucher College in Baltimore, both as pianist and conductor. Jeffrey Chappell was the pianist and arranger for DC Express, a jazz vocal quartet plus piano, bass, and drums that held performances in Washington, D.C., Baltimore, Annapolis, suburban Maryland, and Virginia from1995 to 1997. Jeffrey Chappell has appeared in jazz performances with Jeff Antoniuk, Wes Crawford, Peter Diamond, Andre Enceneat, Paul Fischer, Emmanuel Fournier, Noah Getz, Pepe Gonzalez, Ken Hall, Seth Kibel, Skipper Kripitz, Lonny Jacobson, Rob Leon, Lynda MacNeil, Jon Mathis, Rich O’Meara, Jennifer Parde, John Pineda, Stan Wilkerson, Steve Sachse, Courtney Sappington, Roger Van Sant, Matthew Watson, and others. He has performed own solo jazz tune arrangements in his piano recitals since the 1980s. Jeffrey Chappell is the Director of Jazz Studies at Goucher College in Baltimore, Maryland. He teaches courses in Jazz Theory I, Jazz Theory II, Improvisation, Jazz History, and Jazz Ensemble, as well as private lessons in classical piano, jazz piano, composing, arranging, and songwriting. He is a faculty member at the Levine School of Music in Washington, D.C., where he teaches jazz and classical piano and courses in Improvisation and Jazz Theory. He has given workshops training music teachers how to teach improvisation and jazz for the Maryland State Music Teachers Association, Washington (D.C.) Music Teachers Association, Northern Virginia Music Teachers Association, Montgomery County (MD) Music Teachers Association, Greater Laurel (MD) Music Teachers Association, California Music Educators Association, and Music For Minors II (Fremont, CA). Jeffrey Chappell has also given courses in Improvisation and Intro to Jazz Piano for the Professional Studies Program at The Levine School of Music, training faculty members how to teach jazz. He is former Co-Chairman of the Jazz Department at the Levine School of Music. Jeffrey Chappell was the director of the Goucher Summer Arts Institute Jazz Camp for middle and high school students from 1999 to 2013. Jeffrey Chappell’s “The Definitive Guide to Mastering Music Improvisation” is a bestseller on udemy.com, a leading online video course platform. It has three hours of instruction about the benefits, techniques, and solutions to common barriers in music improvisation. For more information, visit the course webpage. You can also click to download a pdf of his Improvisation Exercises. Jeffrey Chappell’s solo piano arrangements of standard jazz tunes appear on “Pick It Up” on the Centaur Records label. His jazz-inspired original compositions appear on “Jazz Sonata” on the Centaur Records label. He performs his arrangement of his original tune, “Melancholy Moon” with clarinetist Chester Brezniak on “Clarinet Now” on the Centaur Records label. His collaborations with saxophonist Noah Getz on jazz-inspired American compositions appear on “Crossroads” on the Albany Records label. 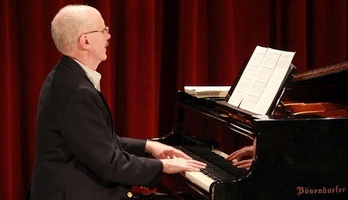 Jeffrey Chappell is the composer of numerous original works for solo piano and instrumental combinations, including jazz tunes, three piano sonatas including Jazz Sonata, and others. He has written numerous arrangements for jazz ensemble and for jazz vocal quartet a cappella and with rhythm section. Jeffrey Chappell is the author of articles on jazz and reviews of jazz CDs for Piano & Keyboard Magazine. These include “Speaking the Lingo: Jazz Explained for Classical Musicians” and “Start Playing Jazz in About Five Minutes”. Jeffrey Chappell studied privately with Charles Covington, Pepe Gonzalez, and Bob Deiner, and participated in workshops with Mark Levine and Benny Green.